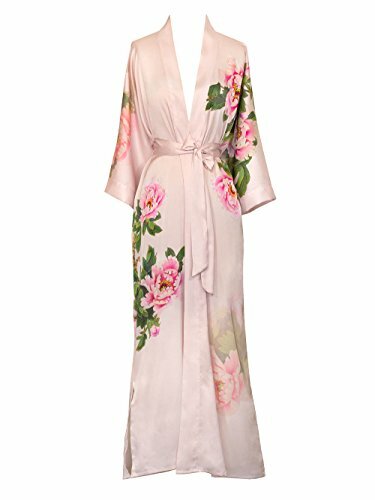 Pamper yourself and relax in this soft, satiny kimono robe. It can be worn at home as a lounge robe or bathrobe, or as a light wrap jacket on warm days. The highly detailed print is continuous over a field of color, featuring blossoms and peacocks, a symbol for integrity. This robe offers a great value, made from a higher quality, easy care fabric with French seam construction throughout to assure a lifetime of enjoyment. Choose from a large selection of colors, many ours exclusively. This kimono is a pretty and practical robe or cover up, and a gift anyone would love! Imported. Dry clean or machine wash cold, gentle cycle, tumble dry low. *For more information, please contact us before purchase. Exclusively ours, enjoy every day luxury in printed silky charmeuse robe. An ideal lounge kimono, a practical and pretty dressing gown for bride and bridal party, or a comfortable and beautiful robe for a new mom. French seam construction throughout assures a lifetime of enjoyment with sash tie closure, belt loops and inside tie. Imported. Machine wash cold, gentle cycle, hang dry. *For more information, please contact us before purchase. 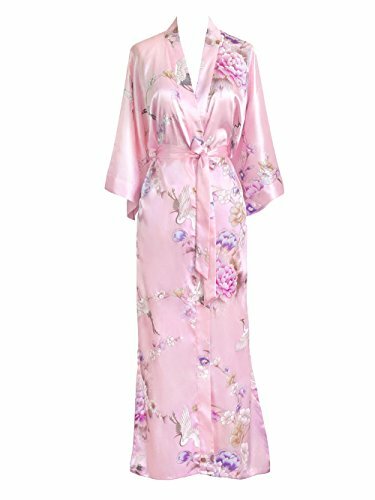 Material:supreme quality satin fabric with the feel and look of the silk Style:Kimono robe with sash tie closure,belt loops Size Measurement(As the size is Asian size.please choose 1-2 size up!!! ): S size-US(0-2): Shoulder 21.26"---Sleeve 8.66"---Bust 28.34"---Length 26.37" M size-US(4-6) : Shoulder 22.05"---Sleeve 9.06"---Bust 34.3"---Length 31.2" L size-US(8-10) : Shoulder 22.83"---Sleeve 9.06"---Bust 35.9"--Length 31.6" XL size-US(12-14) : Shoulder 23.62"---Sleeve 9.06"---Bust 37.4"---Length 32.0" XXL size-US(16-18) :Shoulder 25.20"---Sleeve 9.06"---Bust 39.8"---Length 32.4" Package Includes: 1x Women Kimono Robe If you have any problem about the products, please feel free to contact us. Thanks. Size Chart: S: Length 123cm (48.4"), Bust 112cm (44.1"), Sash Length 150cm (59"), Shoulder to the bottom of the sleeve (Length) 41cm (16.1"); L: Length 132cm (51.9"), Bust 130cm (51.2"), Sash Length 175cm (68.9"), Shoulder to the bottom of the sleeve (Length) 44cm (17.3"). Women's Elegant Lace Trim Solid Color Kimono Long Robe. Available in many different colors. Perfect for loungewear and sleepwear. Perfect gift for bridal shower, wedding night, gifts or everyday wear. Kindly reminder: All of our products are physical shooting live models. The color of the products may slightly vary from the pictures shown due to lighting condition, shooting angle, different monitor etc please understand. Thank you. Relax in soft luxury and experience comfort and style with this robe. Made of 100% polyester, easy to care for. Cut in one piece to the sleeves, making this robe more comfortable and enjoyable to wear. Perfect gift for your friends and loved ones as well. * All measurements are approximate. Size Measurement:One size fits for US 0-14: Bust 41.0", Length 49.6", Sleeve Length:19.6"Size may be 1-1.5 inch inaccuracy due to hand measure. If you are not sure, please contact us freely! Due to difference Computer Minitors,the color maybe slightly diffrent from picture. 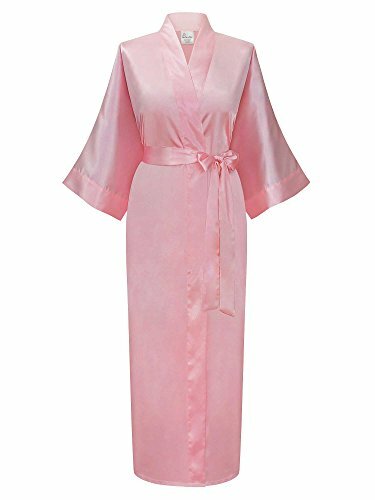 Compare prices on Pink Long Satin Robe at ShoppinGent.com – use promo codes and coupons for best offers and deals. Start smart buying with ShoppinGent.com right now and choose your golden price on every purchase.